You may use vegetables of your liking. I used cucumber which I sliced in thin slices, carrots – sliced in the same way, red pepper, finely chopped cabbage, garden salad, pumpkin and sunflower seeds, lemon peel, lemon juice, olive oil and salt for spicing up to your taste. Make the hummus by blending the boiled and cooled off chickpeas, all spices, the garlic, a bit of water. Start blending, adding olive oil through the opening. The hummus should be thick and smooth. Put it aside while you prepare the vegetables for the salad. Mix all vegetables and pour on top dressing made from lemon juice, olive oil and salt. 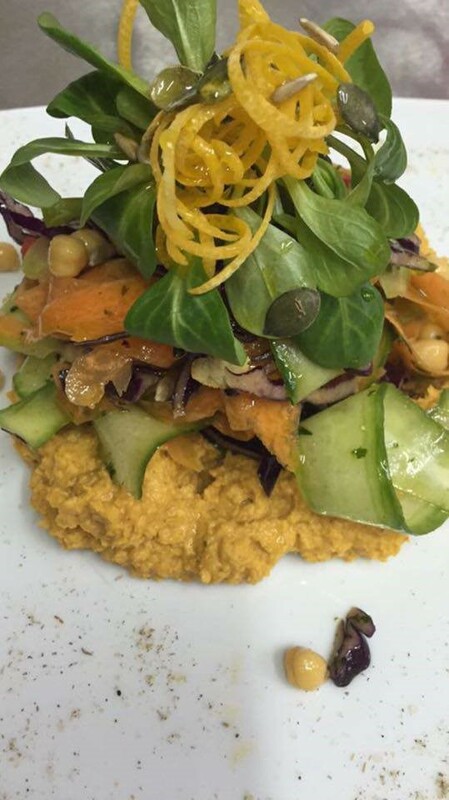 Serve the hummus in a plate, with the vegetable salad on top of it. To finish, add lemon peel and sprinkle with the seeds and some chickpeas.